I am ALL about the costume on Halloween. I don't decorate the house much because I'm usually working on costumes. I start thinking about my costume a least a month or two in advance. I want my costume to be something clever or different or just plain crazy - hopefully all three. Last Halloween's Little Edie from Gray Gardens costume fits the bill. It was super easy to make too. Yay for easy! "Easy for you Lisa," you say, "You know how to sew. I can't sew. I can't make a Halloween costume. I'm just gonna to buy one at the pop up Halloween shop." Stop right there! You do not need to know how to sew to make a great Halloween costume! Last Halloween I went to a party. I saw tons of clever homemade costumes. Some were home sewn but most, like the Little Edie costume I made were not. 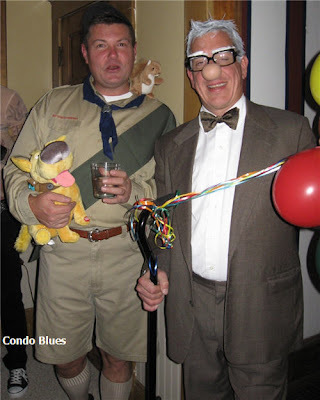 My two favorite costumes from last Halloween are Russell and Carl from Up! "Russell" proudly pointed to the squirrel on his shoulder all night. "Carl" tied helium balloons tied to his cane. 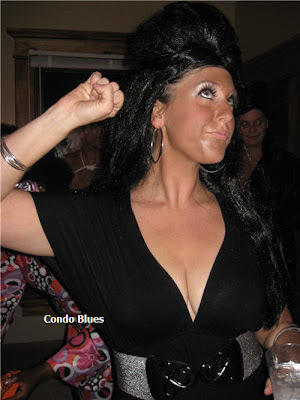 Sookie from Jersey Shore – Complete with streaky, uneven bronzer. The Care Bears were smart. They built their costumes using sweat shirts and sweat pants. Most of the party, including the bar was outside. It was a very cold night. Brrrr! You gotta love October in Ohio! You never know what you are going to get. 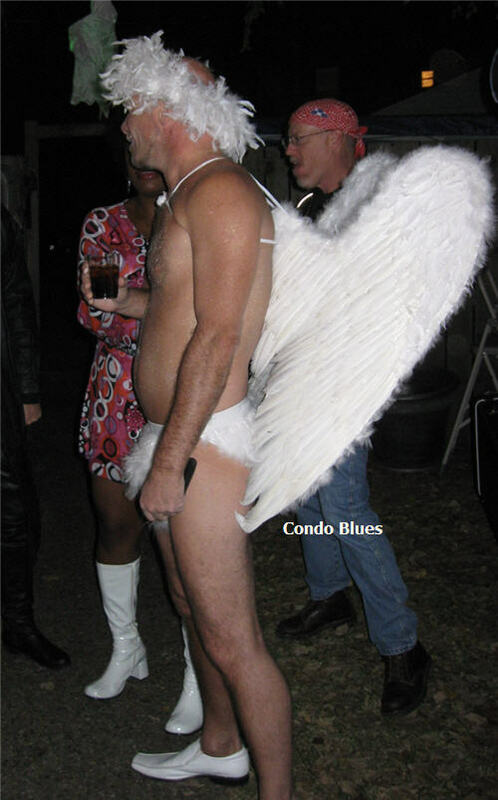 Speaking of cold, the angel spent the entire party outdoors. Apparently hot glue and feathers are more insulating than I thought. The Angel won the Men's division of the party's costume contest. The Yips are a sorta sew option. They hand sewed (You might try hot glue) stretch velvet over a pool noodle for the mouth. They Velcroed thin black fabric to the inside of the pool noodle so they can see where they are going. They removed the Velcro panel to eat and drink. 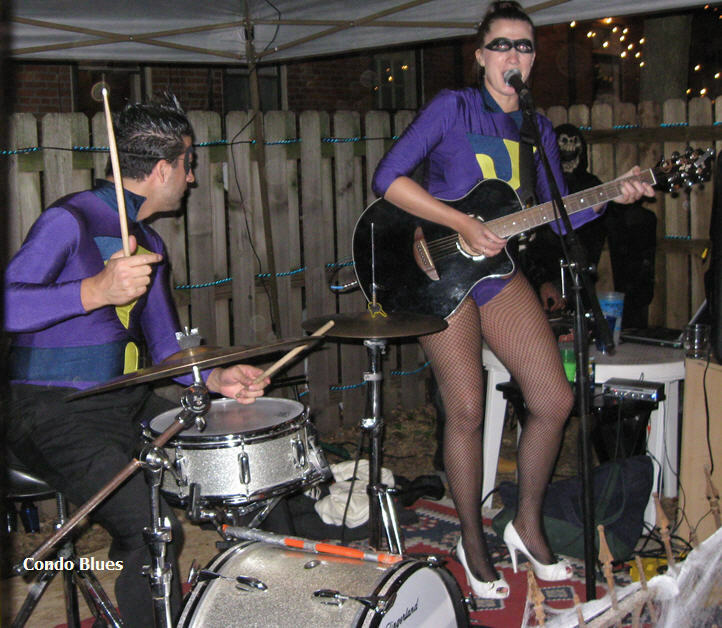 Our hosts hired a local band named The Wonder Twins. 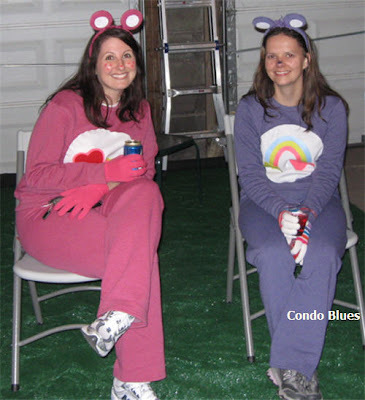 They came to the party dressed as Zan and Jana! 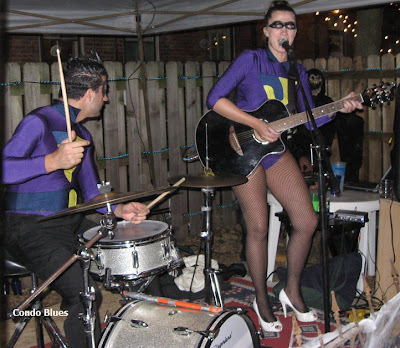 Purple leotards with fabric cutouts of Zan and Jana's logos. Easy! 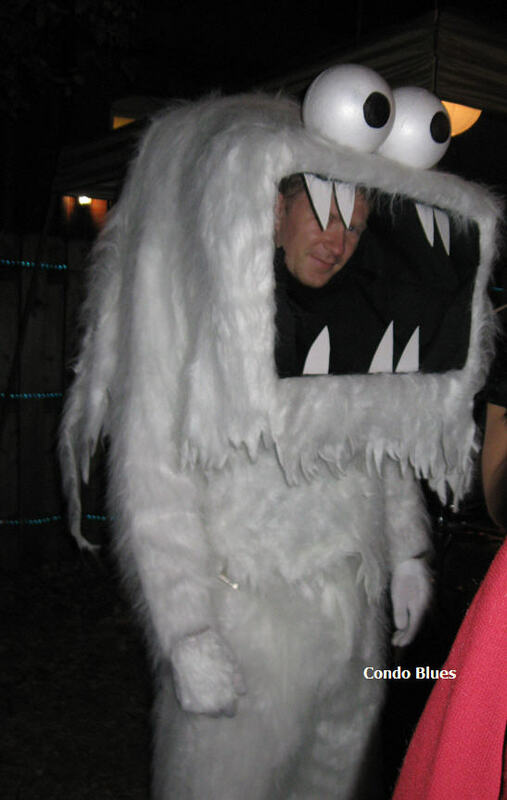 The abominable snowman! He was another costume contest winner. The abominable snowman also made a thin black fabric curtain for the mouth area which he could remove for eating, drinking, and the millions of, "Who is in that costume?!" questions. The Mayrelle sisters from Saturday Night Live. Most of this costume was purchased and worn as is from a thrift store. Hil-ar-i-ous! Some really creative costumes! 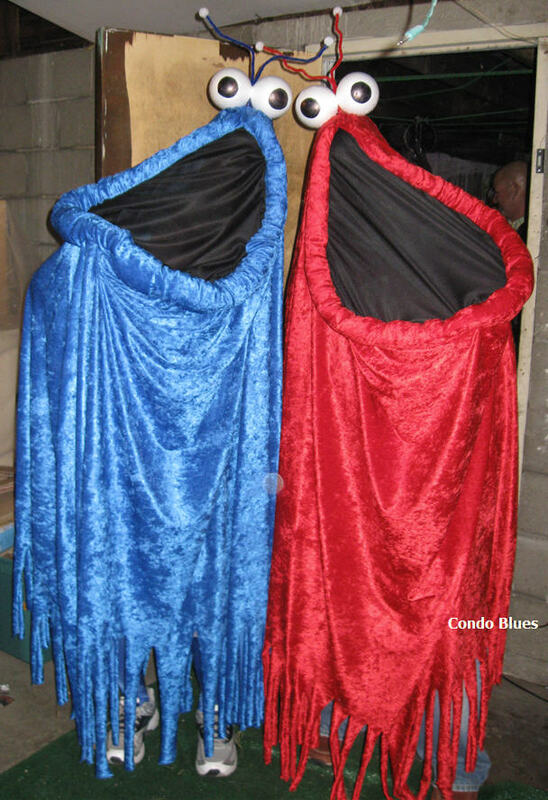 Come over and see a few of our homemade couples costumes! Great costumes. And a great assortment, too. I love Halloween creativity. Your Little Edie costume is right on target. This has GOODWILL written ALL over it! I love Edie (genius) and the scary girl from SNL....those tiny hands freak me ooouuuut, and I loved the yips as a kid! Great compilation of costumes I would have never thought of! These are great costumes! The Yips and the Carebears are totally my favorite. Such cute ideas. I'm all putting together costumes from thrift stores. Last year I put a Jack Sparrow costumes together for my son almost entirely out of thrift store finds for less than $10. I'm going as Jayne Cobb from "Firefly." I got a friend who knits to make the hat for me. I already had boots, pants, and shirt. This post totally cracks me up!!! Great Costumes Ideas!!! No excuses now, right! I'm glad you stopped by and you are so right, there's nothing that a can of spray paint can't fix! I'm your newest follower!!! Stop by and visit often and I'll do the same!!! Great ideas! I love Russel and Carl from UP! Thanks so much for linking up with us at Show & Share! Can't wait to see you again on Wednesday!